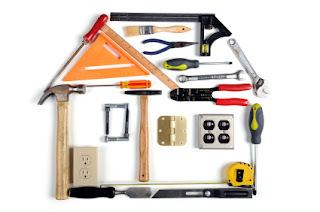 Home repairs are never fun, but are often times necessary. As with anything that is used every day, parts and pieces get worn out. This daily wear and tear may lead to a need to fix or replace items throughout your home, often in areas you are not used to seeing and dealing with on a daily basis. The below content shares tips and tricks for common household repairs that can be done on your own, avoiding costly expenses by outside repairwork. Be prepared for possible plumbing emergencies with the below tips for easy do-it-yourself plumbing repairs and tools for an emergency plumbing kit. Before any plumbing work is needed, all homeowners should know where the main water shut-off valve is located. If an issue should arise, already knowing where your shut-off valve is located may save valuable time. In addition to the main shut-off valve, separate isolation valves cut off the water to individual areas of the home, allowing for service to continue to the remainder of the house. Most of the DIY repair tips are a temporary solution until a professional plumber can do a permanent fix. Unless you have ample experience with electrical work and repairs, we highly recommend you hire a professional electrician. Don’t risk electric shock or doing the work incorrectly as it can lead to bigger problems. Also, for future resale needs, you will want all electrical work to comply with the current code, which a professional electrician will ensure. Repairing dirty grout may be as simple as a thorough cleaning using a little “elbow grease” to get the job done. A good scrubbing pad, such as a “Mr. Clean Magic Eraser” product, can ease the work and get tough grout clean again. If you need to replace the grout, we recommend using a grout-removal tool. It is a time-intensive process, but is necessary before putting down new grout. Once the grout is removed and the area is cleaned, you are ready to replace the grout. Tip: Consider a different grout color to change up the area and give it a new look. Save on your energy bill by fixing under door drafts. The easiest option is to simply purchase and use a draft stopper (also called a draft guard or draft blocker). It has to be on a surface where the material can easily slide along the floor. The device slides under the bottom of the door and sits on both the bottom front and back of the door, creating a tighter seal between the door and the floor. The more permanent and recommended solution is to install appropriate weatherstripping to the door. Be sure to measure your door and purchase the appropriate length of weatherstrip guard. If you have hinges that squeak or doors that stick, the fix can be quite easy. For squeaky hinges, consider using the common WD-40 spray solution, available in most hardware sections of your local store. An even quicker fix is to apply a small dab of petroleum jelly to the hinges. It is less messy compared to an oil or spray, and works just as well. For doors that stick when you open and close them, you will need to shave off the section of the door that is sticking. It can be the top, bottom, or side of the door. It can even be caused by a damaged or worn door frame. Sometimes, even a settling house can cause the door frame to shift slightly causing the door to stick. Tip: To easily locate the area of the door that is sticking, rub the inside of the door frame with chalk that is a different color than the door and frame. Open and close the sticky door a couple of times, then look for chalk that has transferred from the frame to the door. That location is the spot causing the door to stick and needs to be shaved down. Windows that sit for a long period without being opened can build up dirt and debris, causing the window to stick and making it difficult to open. Often times, strength is all that is needed to pry open the window repeatedly and work out the dirt and grime. A thorough cleaning can cure the problem. For a more severe stuck window, you may need to use WD-40 (or a similar grease product) and remove the window sash to get the window open. Simpler drywall damage can easily be repaired without hiring out the work. Start by cleaning out the hole with a blade knife. For medium or large holes, use a drywall metal patch. Fill the hole or divot with painter’s putty and let it dry completely. Spackle over the dried putty. Sand the drywall surface smooth, then clean off all the dust. If needed, repeat with another layer of putty, spackle, sand, and dust removal until the surface is completely smooth. Once dry and clean, you are ready to paint. Tip: Although it may be obvious, we should still remind you to have color-matching paint ready to complete the repair. Once the drywall repairwork dries, you will need to paint over the area with the same color of paint. Prep the work area by using rubbing alcohol to clean the surface. Allow the space to dry completely, then apply a thin layer of new caulk in the same area where the old caulk was removed. You will need a putty knife and caulk gun to help with this repairwork. Tip: For any space containing mildew or mold, apply a mix of ⅓ cup bleach to 1 gallon of water (or use a store brand cleaner containing bleach) to kill and remove the problem. Allow to dry completely before re-caulking. Gutters and downspouts remove runoff water from rain and snow away from the home and the home’s foundation. Debris in your gutters plus the weight of snow and ice can cause damage to your gutters. You should check your gutters at least twice a year, once in the spring and again in the fall. Remove any debris and repair any damage done to your gutters to ensure water runoff can easily move away from your home and foundation. Patching up roofs can be tricky. If you have prior experience with roof repair, then you may be able to handle it yourself. Otherwise, we recommend using a professional for this type of repair. LOOKING FOR THE RIGHT REPAIR PERSON? Ask trusted friends and family in your area for a referral. Many people solicit the help of local “handyman” services and professionals that specialize in specific home repairwork. Your real estate Agent will also have some vetted and reliable repair service referrals to provide to you. If looking to purchase a home, your Home Inspection and Appraisal will make you aware of any home repair needs. Your Agent can help with finding an excellent Home Inspector. Your Lender will ensure you receive the results from your Appraisal. There are a number of very helpful video tutorials available at your fingertips. With a quick YouTube search, you can find many videos to lead you through a repair. For many people who are handy with home repairwork, a DIY solution to simpler issues can save on both time and budget. A Word of Caution: it is still wise to consult a professional to ensure the repairwork is complete and avoid additional work and possible damage from a DIY solution. Truth be told, many home repairs are caused by ignoring a small issue that turns into a bigger problem. Some home repairs can be avoided by simple home maintenance and routine deep cleaning practices. Consider spring cleaning and winter preparation work that may be needed for your home. Also, hiring a once-a-year or seasonal home deep cleaning service is a good idea. Considering a Fixer Upper? Read this related post about whether a fixer upper makes sense for you.